Instead of spending our budget on celebrity endorsements and expensive ad campaigns, we devote all of our resources to the world’s best yarn with a comfortable “easy to wear” design, yet edgy in its core, in order our “luxury” products obtain reasonable prices, accessible to a wide audience. Because of this circular, sustainable and fair organization structure, we can create and transform the existing products to the requested needs and at the same time provide the end-consumers with meaningful luxury products of affordable prices. Sustainable products do not mean lack of design inspiration, in contrary, creation with alternative mind-thinking and advanced but still natural materials, is the inspiration for surprisingly innovative products. This is PEPPER VALLY, definitely a knitwear manufacturing hub, but not as we know it. We are currently presenting products also in the field of “smart” knitwear – textile computing knitted products – in collaboration with other partners through our award winning project “Feel More Knitwear”. We remain passionate users of natural materials and we try to find ways of incorporating advanced scientific and technological characteristics into fashionable products with realadded value in present and future everyday life by creating “smart” solutions and not “fake” needs. Our “Feel more Knitwear” is a contemporary active-wear sweater with integrated knitted sensors of biometric data, such as heart-rate diagram, able to decode in physical and emotional health evaluation in Sports, Health and Wellness applications. We managed to integrate advanced biometric sensors into knitwear structure, combining the use of natural yarns. 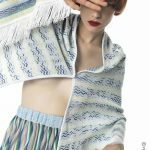 This led us to a fully workable, “easy to wear” and washable prototype that delivers continuous monitoring of biodata, able to adjust through a productive/effective way into a whole knitwear collection, as also accessible to a wide audience. Our inspiration is our philosophy, that sustainability is the art of combining science, manufacturing and design with the most effective way for self-improvement and better communication with other people as also safe interaction with nature and surroundings, and specific for this idea, to understand what’s going on inside our mind and body. Our prototype is a revolution in the knitwear manufacturing process and design, materials sustainability and tech adds possibilities. An upscaling process project for applications in the fields of Activewear Fashion, Sports Performance, Health and Wellness, as also Digital Technology. We are currently presenting our prototype in Milan Design Week 2019 (8th-14th April), located in the “Discovering Super Design Show” area, a space dedicated to innovative and trendy products and in the Dutch Design Week in October 2019 in Eindhoven (The Netherlands). Come for interaction and live an experience from the sustainable future by wearing our E-KNIT during the events.